Almost 50 Freemasons attended the installation meeting of Lodge of Great Endeavour No 3597 to support and witness Eric John Hancox (John) being installed into the chair of King Solomon. A highly charged emotional evening ensued with several statements of excellence being made. The principal guest was Assistant Provincial Grand Master Kevin Poynton. The lodge was opened by Charles Carr, WM and the normal administration duties undertaken in the usual form. 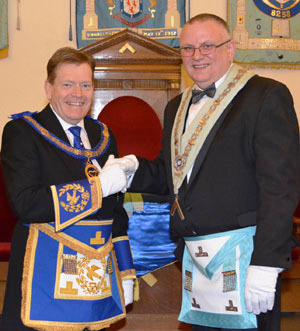 The lodge was opened in the second and third degree and then the principal guest Assistant Provincial Grand Master Kevin Poynton, was admitted in due ceremonial style. Kevin was accompanied by grand and Provincial grand officers including Dennis Rudd, Jack Forsyth, Gordon Amos, Stan Churm, Chris Eyres and Andy Barton, (group chairman). John Walsh and Ken Smith acted as Provincial grand deacons. Charles welcomed all present saying it was a great honour and privilege to see so many very distinguished brethren attending this special occasion and continued by saying he hoped everyone would have a most enjoyable evening. Kevin thanked Charles and the brethren of the lodge for their very warm welcome and commented that he was very much looking forward to witnessing this very special event of John being installed by his father-in-law, Neville Hodson. He continued by saying he was privileged and honoured to be able to be part of the celebration and brought the sincere good wishes of the Provincial Grand Master Tony Harrison. The warmth of the welcome was a complete opposite to the outside snowy chilling temperatures experienced in travelling to the meeting. Charles as a matter of procedure and as a mark of respect, offered Kevin the gavel, which on this occasion he indicated that he was delighted to accept and even more delighted to return it, because he knew that a certain brother was very much looking forward to installing his son-in-law and in no way, would he like to detract from that. Charles, asked Neville Dobson to assist him by occupying the WM’s chair, Colin Boardman to occupy the SW’s chair, Dave Goddard to continue in the JW’s chair and Barry Corcoran to act as IG. All the brethren accepted saying it would be a great honour. Charles presented John to Neville to receive the benefit of installation at his father-in-law’s hand. John was then installed according to ancient custom into the chair of King Solomon. The ceremony was conducted with sincerity, reverence and quite a lot of emotion. Almost everyone felt the strength of the emotion present and how everyone was supporting them both in this moving ceremony. Pictured from left to right, are: Stephen Clarke, John Sage, Alan Murray, Kevin Poynton, John Hancox, Peter Barton, Quentin Newall, Barry Corcoran and Howard Ross. The third degree working tools were explained by Steve Brogden, second degree tools by Chris Cullen and the first degree tools by Charles Carr. The address to the WM was delivered with great dignity by Gordon Amos. John Walsh delivered the address to the wardens and Kevin delivered the address to the brethren of the lodge, which completed the installation ceremony. Immediately following the installation Kevin, on behalf of the Provincial Grand Master Tony Harrison, congratulated John on being installed into the chair for the first time, commenting that the ceremony was a pleasure to witness and was made extra special by being installed by Neville, his father-in-law. He also praised all the officers for the smooth running of the ceremony and the members of the lodge for their work, particularly Neville as the installing master, Charles as WM and John Tyrer as director of ceremonies. He also gave special thanks to the members for their work on presenting the working tools particularly Steve Brogden. He extended his good wishes to all present and hoped John and all his officers would have a happy and productive year and wished everyone the best of health to enjoy it to the full. Pictured top left: Neville (left) and John. Pictured top right: John (left) and Chris Eyres. Pictured bottom left: Kevin (left) and John. Pictured bottom right: Andy (left) and John. At this moment John conducted his first duty, which was to present the charity donations to Kevin. The donations were to; MCF 2021 Festival £500, Warrington Masonic Hall £300, the Diabetic Association £100 and the Stroke Association £100, resulting in a grand total of £1,000. Kevin received the donations saying how pleased he was to receive such a large sum of money. He praised all concerned saying it was such a wonderful amount and thanked the lodge and brethren on behalf of the recipients, stating that the donations would be gratefully applied and would make a difference to people’s lives. The hall catering staff supplied an excellent four course meal for the festival of St John, which consisted of fan of melon, plaice goujons and roast beef with Yorkshire pudding, roast potatoes and seasonal vegetables and fresh fruit salad. Red and white wines were also served during the meal with tea or coffee to follow, which was very much enjoyed by 44 members and guests. Kevin responded to toast number three and remarked on the following; Grand Lodge, once again he thanked the lodge members for the excellent donations and asked them not to stop contributing. He congratulated all the members present who are about to gain Provincial honours or promotion, including John Walsh and Stephen Clarke. He praised Steve Brogden for his rendition of the third degree tools. He also thanked John Walsh and Ken Smith for acting as Provincial grand deacons and John Starkey for his work as group publicity officer, saying that the Province is one of the top 10 in England for its publicity. The master’s song should have been sung by Norman Pritchard; however, Norman was unable to be present because of illness. Chris Eyres very bravely stood in and completed the master’s song with confidence, (several other WMs in attendance offered Chris a commission to sing at their functions, but he declined). He was accompanied and well aided by Ken Magraw. 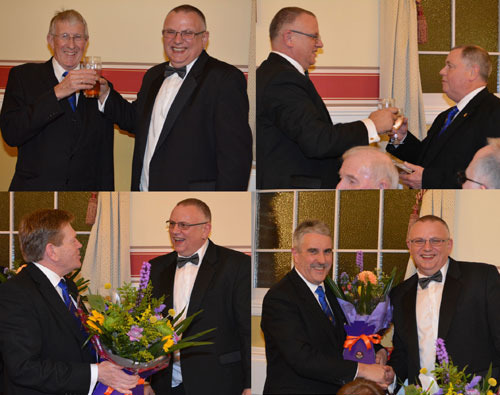 Before leaving for home, Kevin and Andy were presented with bouquets of flowers on behalf of the lodge members. Both thanked the WM and brethren for the flowers and a most enjoyable and memorable evening. Pictured from left to right, are: Chris Eyres, Gordon Amos, Dennis Rudd, Kevin Poynton, John Hancox, Stan Churm, Andy Barton and Jack Forsyth.